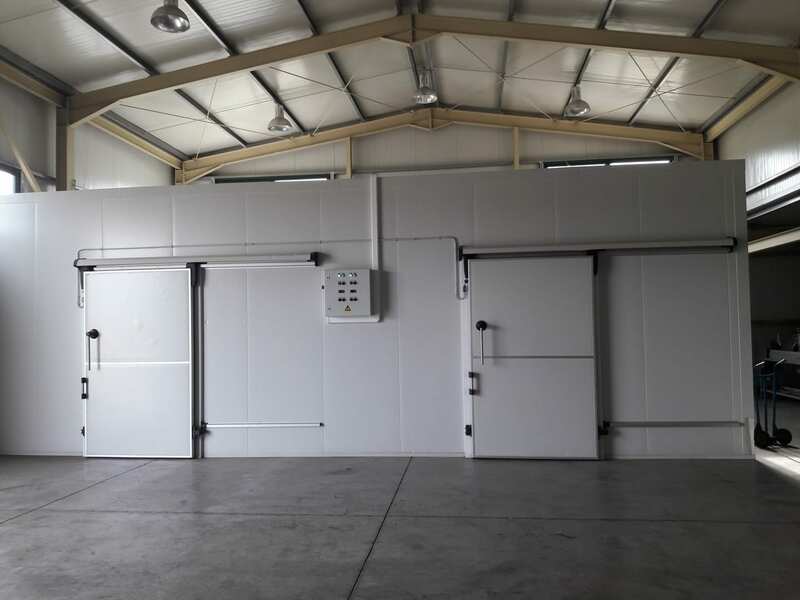 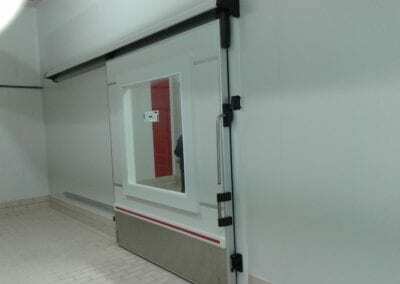 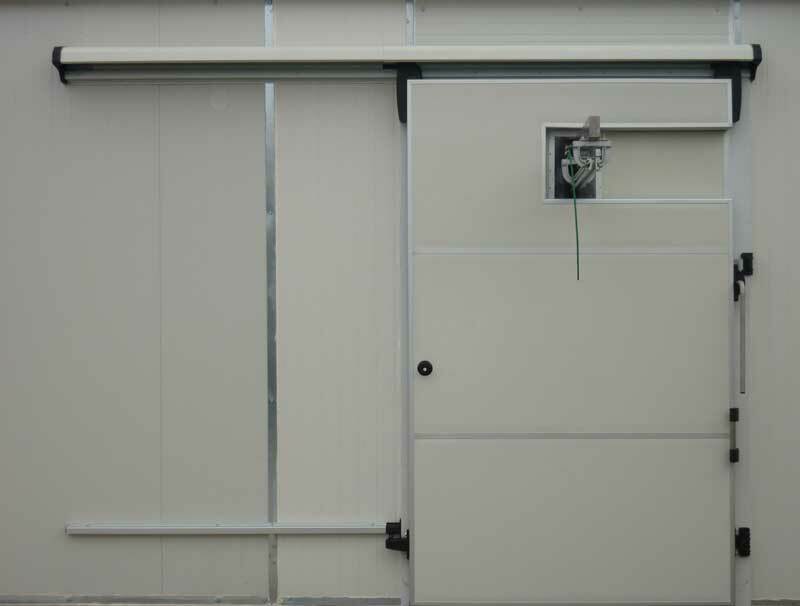 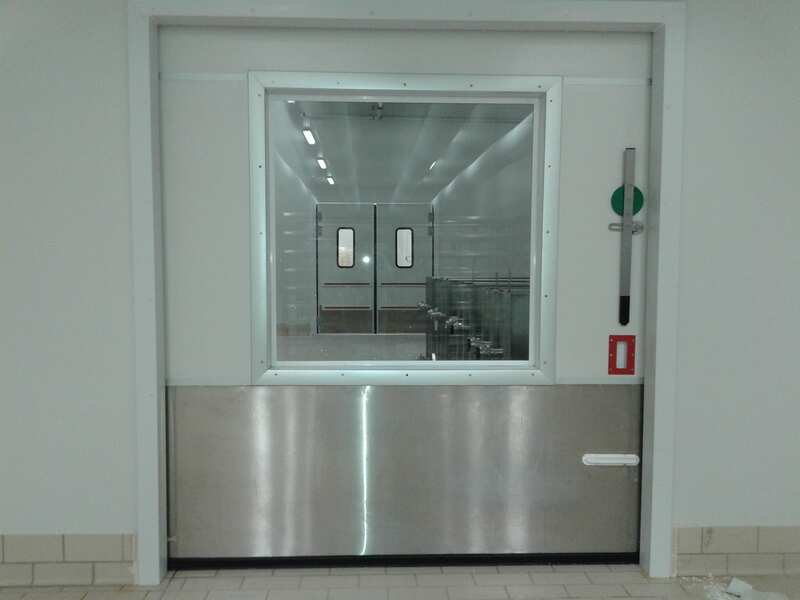 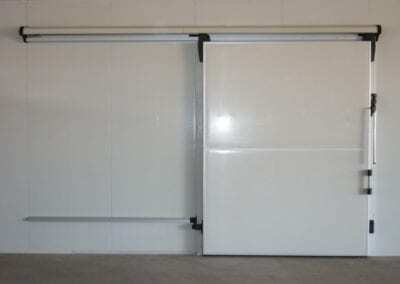 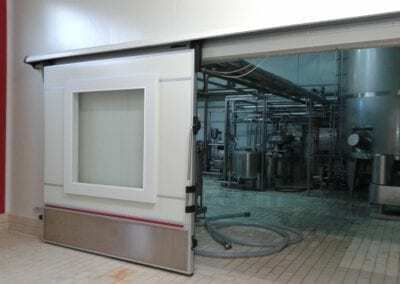 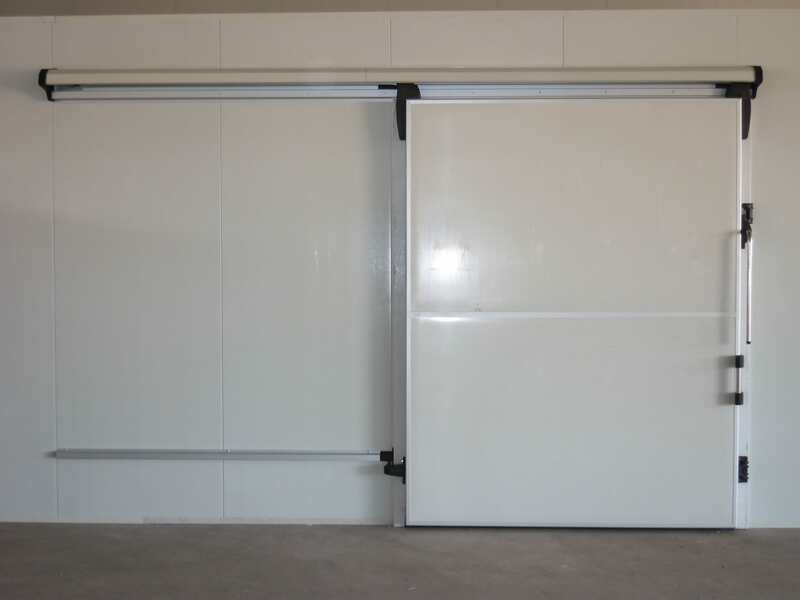 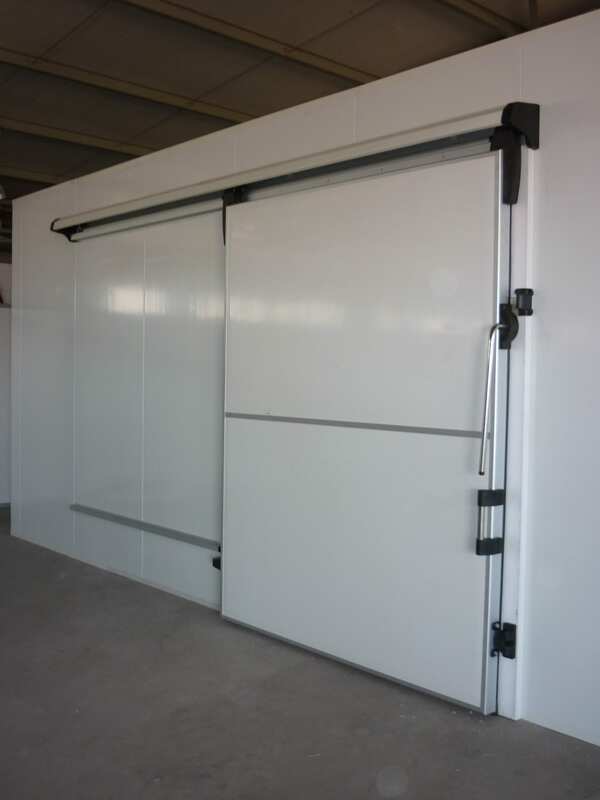 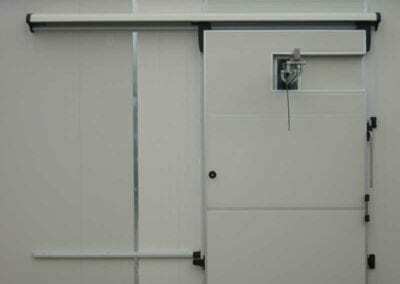 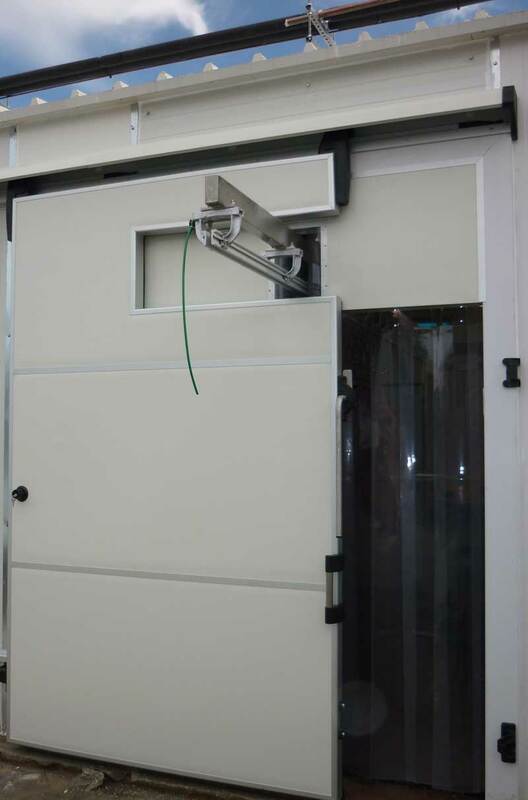 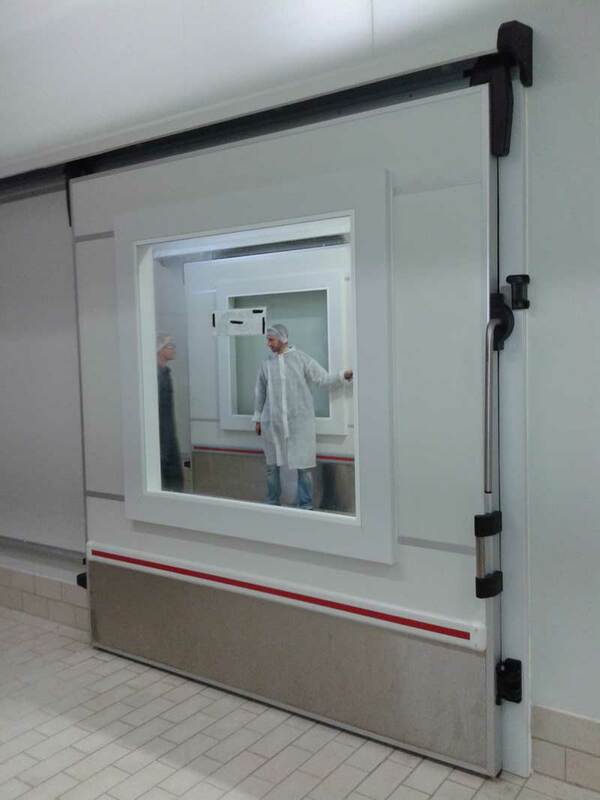 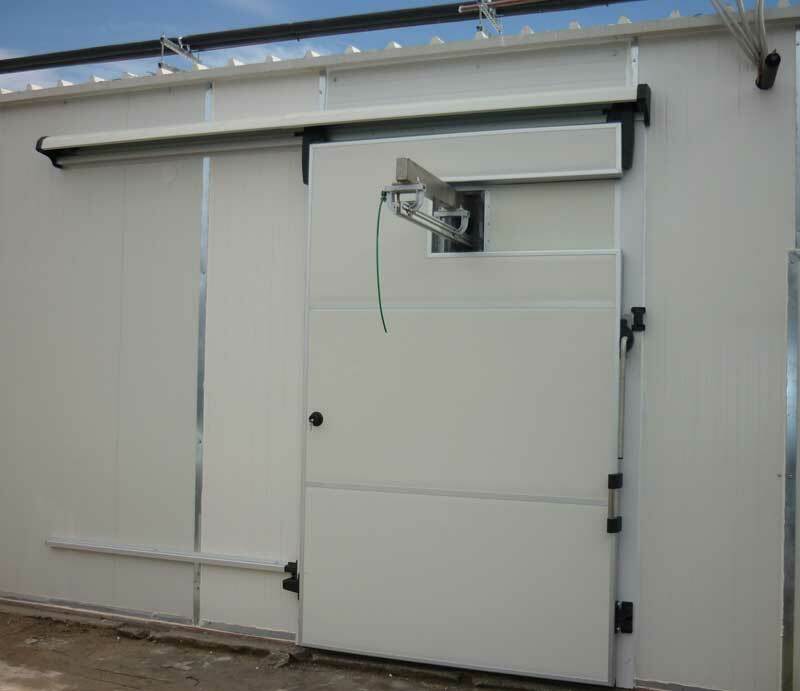 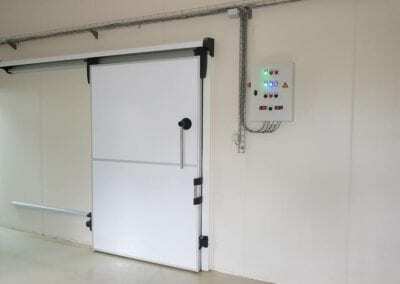 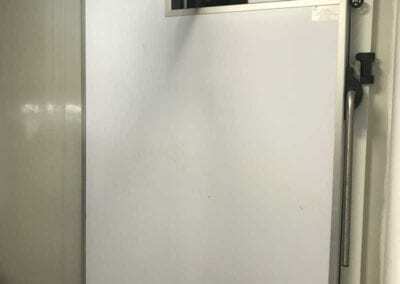 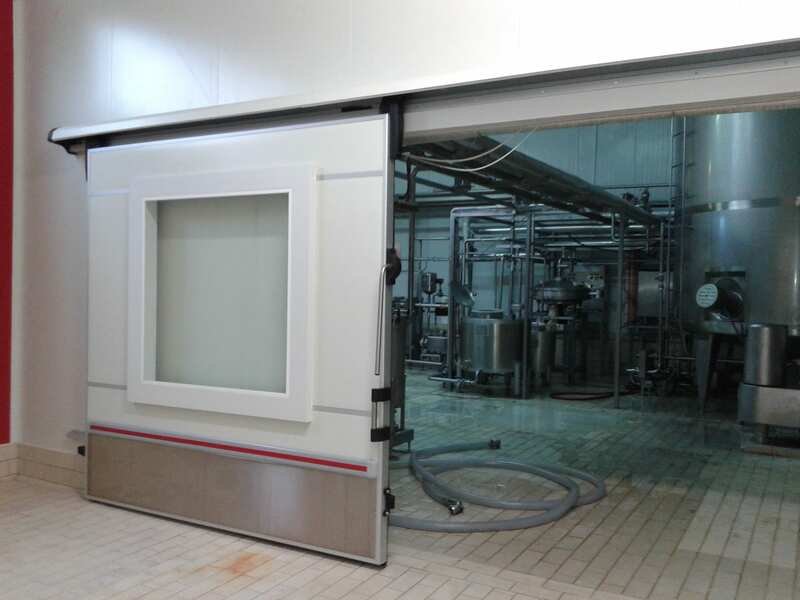 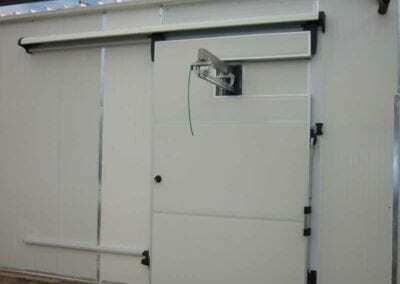 The sliding doors are manufactured three types in terms of thickness of insulation; they come in 80,100 and 120mm, to fit in all types of refrigerators. 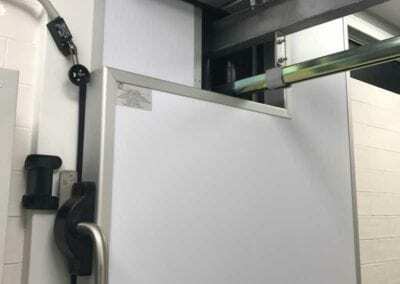 • The 80mm thick door is suitable for use in cold storages with positive temperature and until as low as 0oC, e.g. 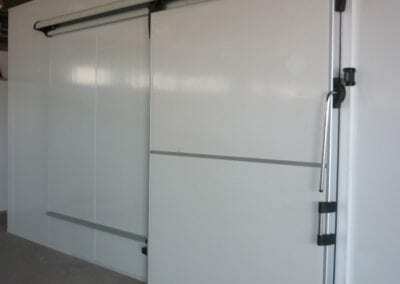 for flowers, vegetables, fresh meat, cheese etc. 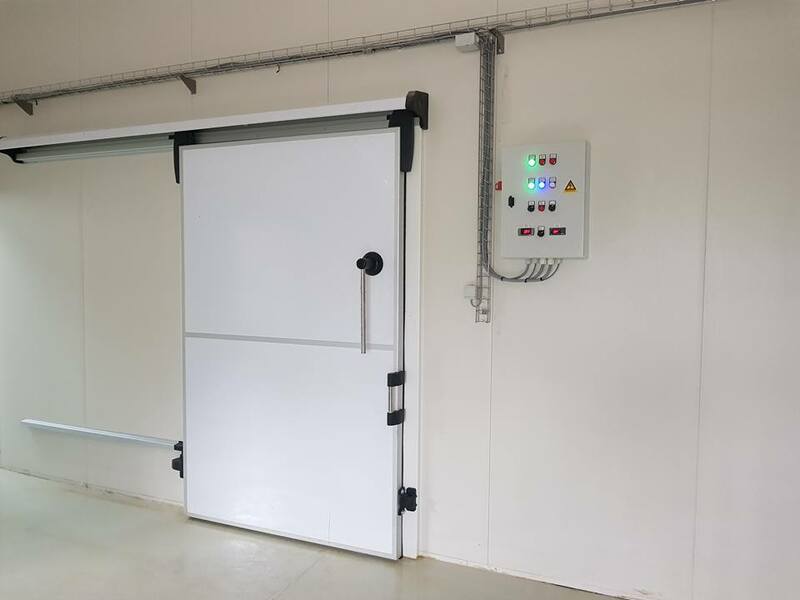 • The 100mm thick door is used in the version without heating resistance for temperatures up to -5oC and in the version with heating resistance for temperatures up to -22oC e.g. 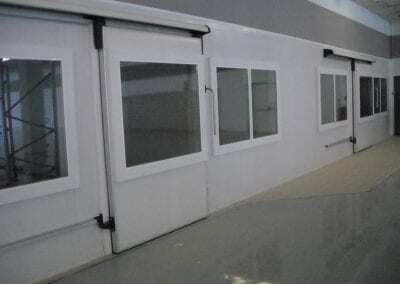 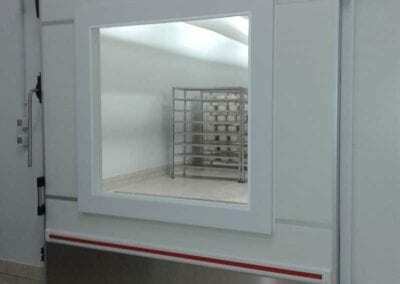 for frozen fish, meat, vegetables, etc. 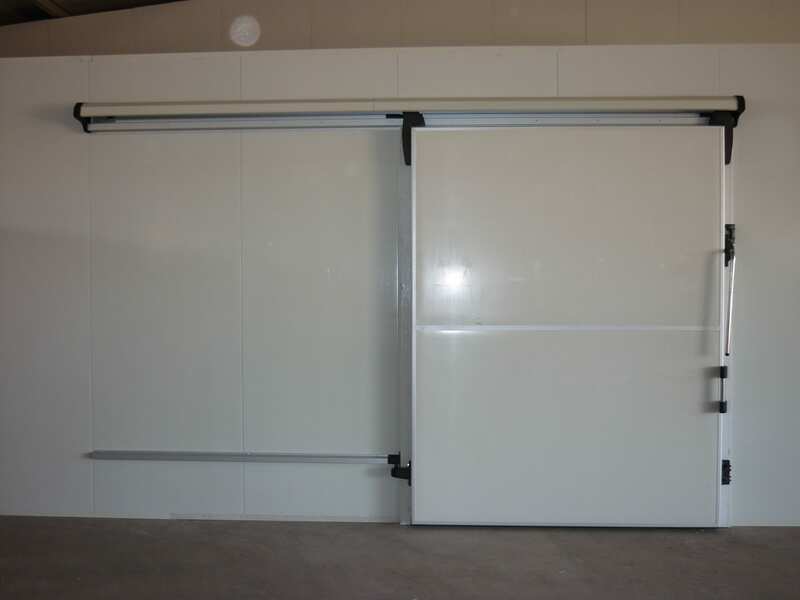 • Doors with 120mm thickness are suitable for use in low refrigerated rooms with temperatures which reach -40oC e.g. 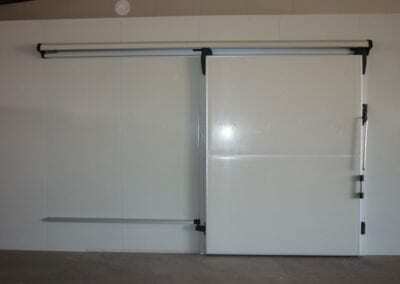 for ice cream, chillers etc. 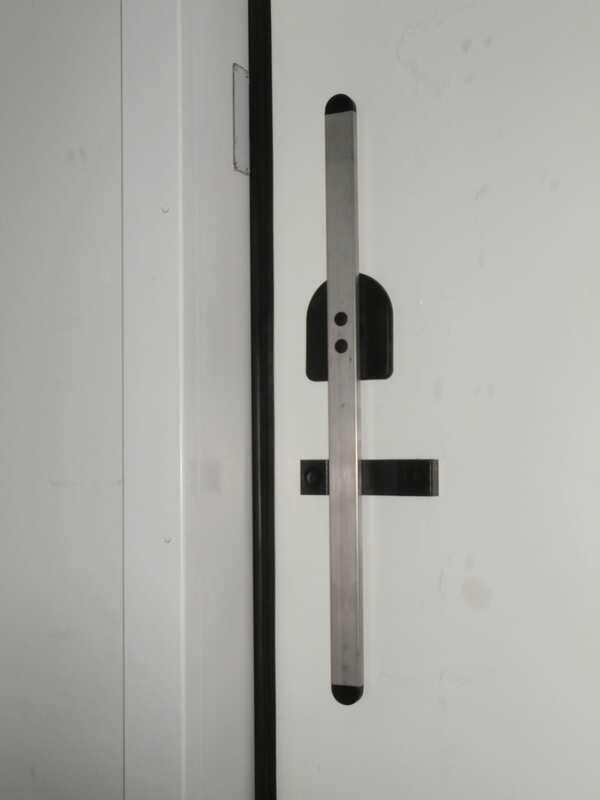 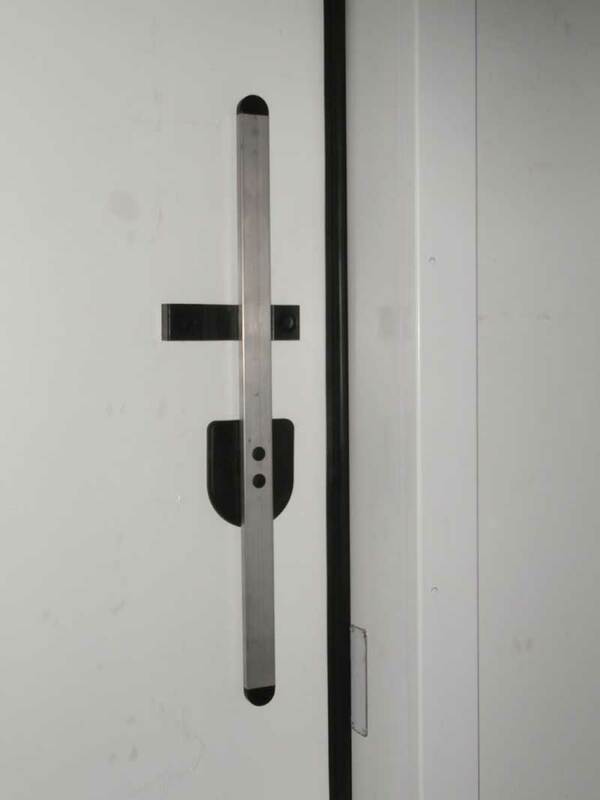 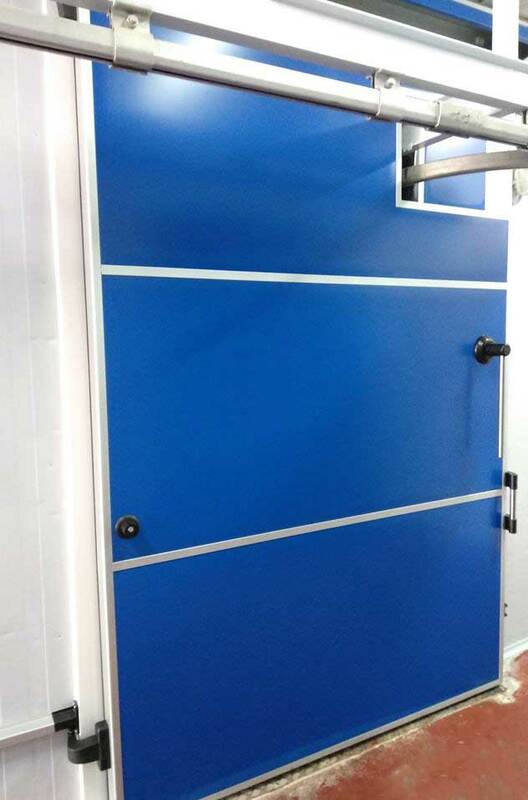 The perimeter of the door leaf is covered with double anodized aluminum profile to withstand potential strikes. 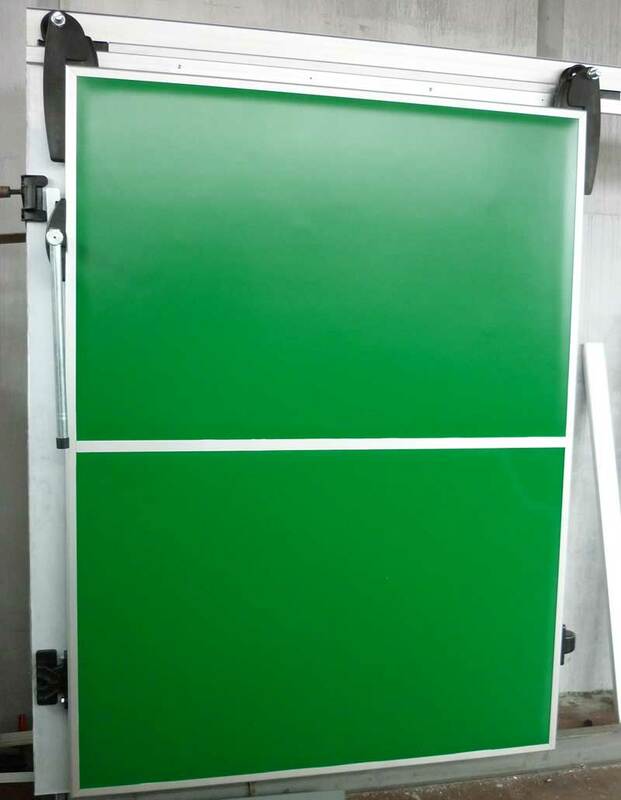 The standard covering is made with pre-painted galvanized steel sheets but we can also make them with PVC pre-coated or stainless steel sheets. 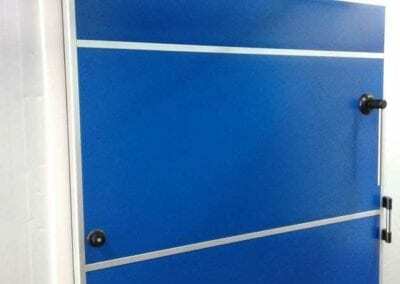 The standard color is RAL 9002. 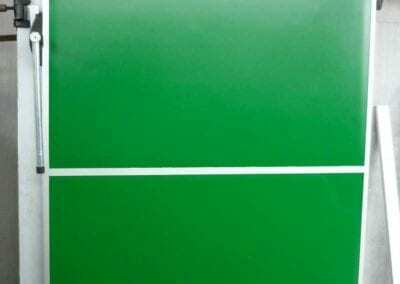 Other colors on demand. 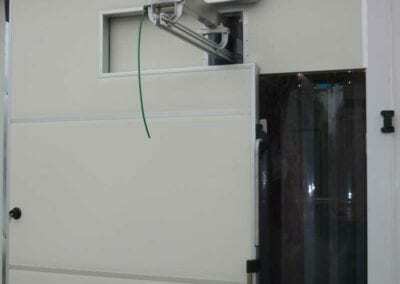 The door is sealed through specially treated soft PVC gaskets. 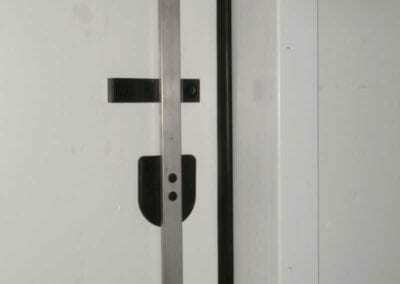 In the 80mm door the gasket fit directly into the aluminum profiles around the leaf. 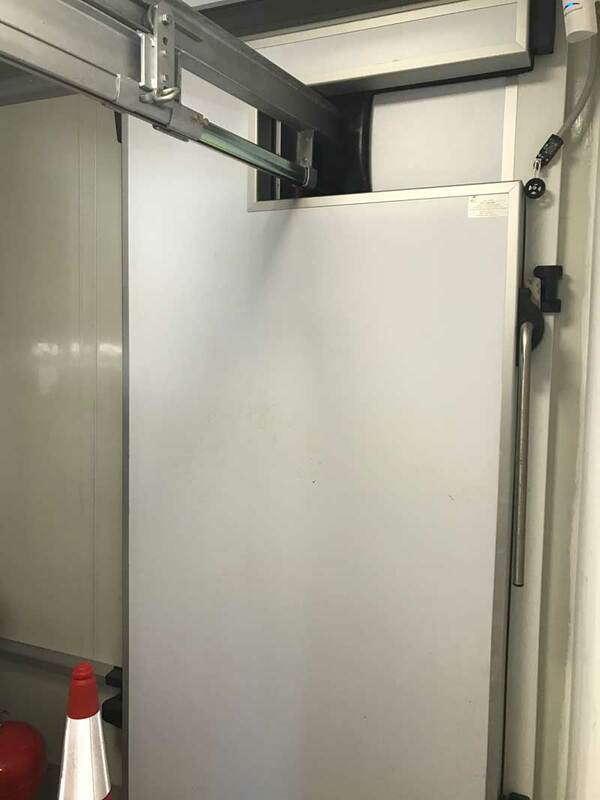 In the 100mm thick door in order for us to stop thermal bridges with the inside of the refrigerator first we cut the continuity of the cold with a PVC profile and afterwards we affix over it the gasket. 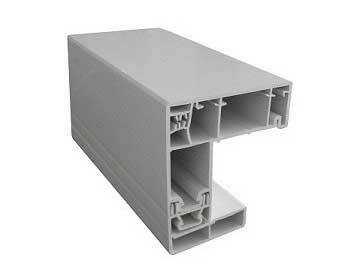 In the 120mm doors there is the hard PVC profile and double row of gaskets. 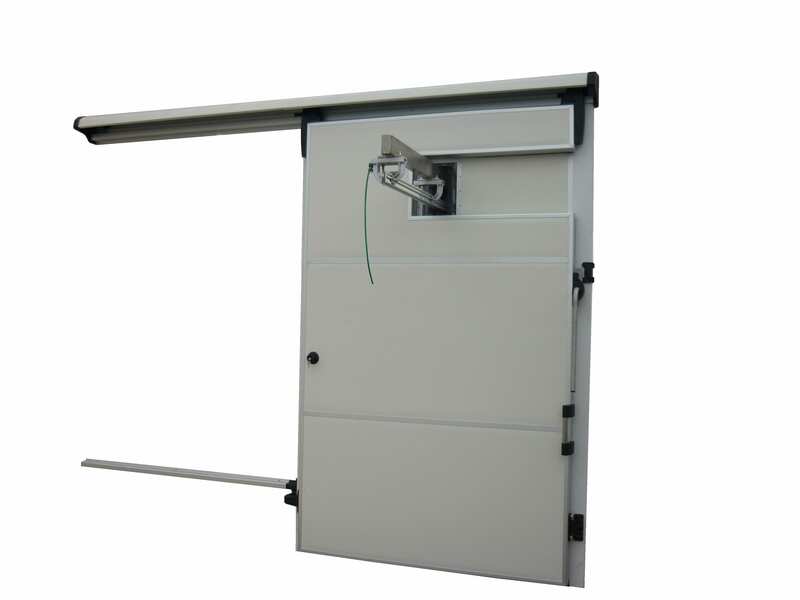 The mechanism used is a combination of anodized aluminum profiles and plastic components in order for us to guarantee smooth and quiet movement. 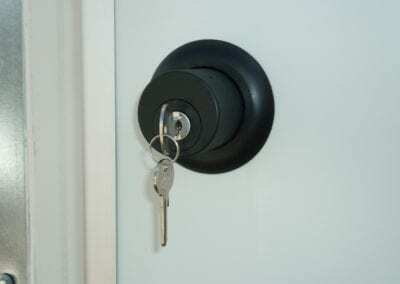 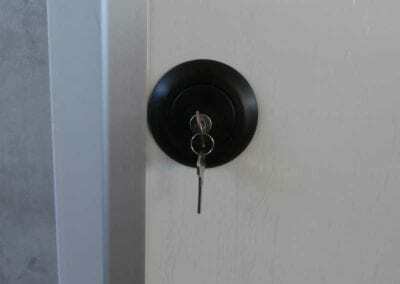 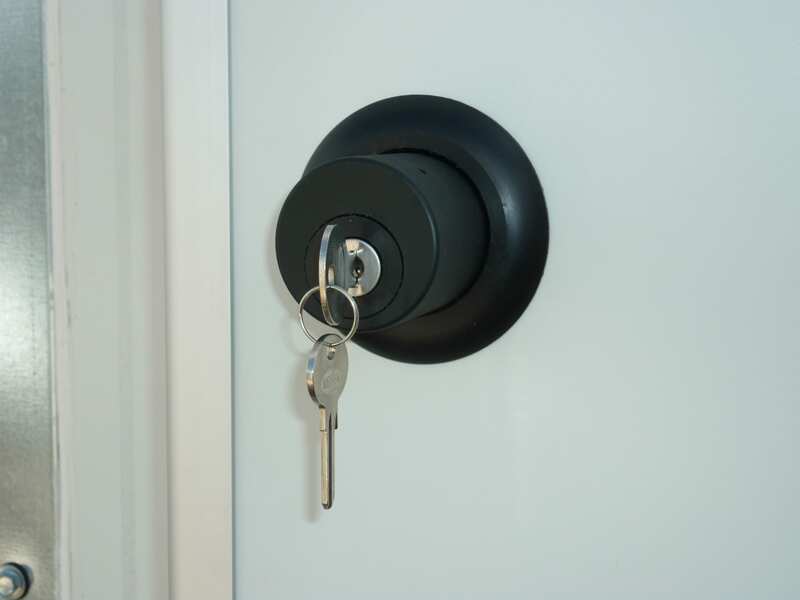 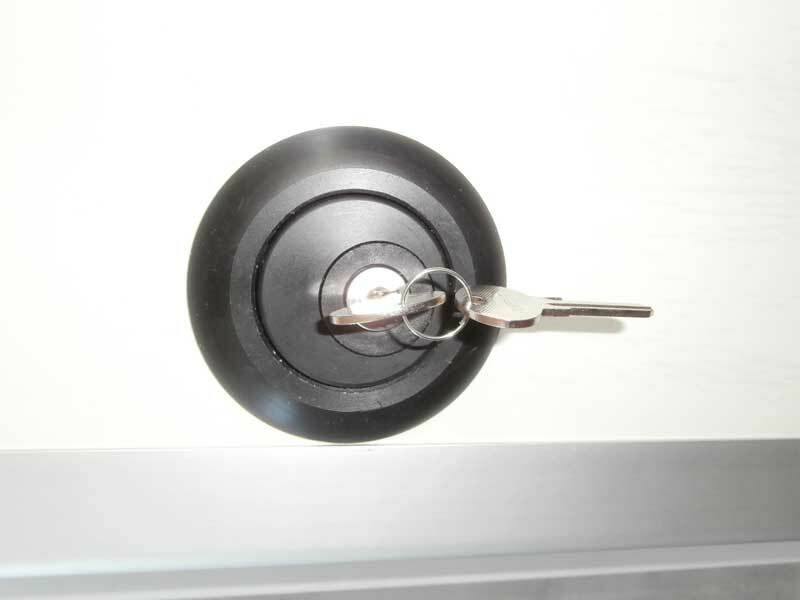 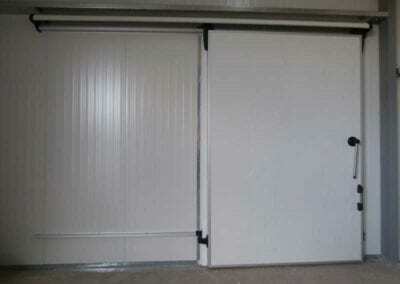 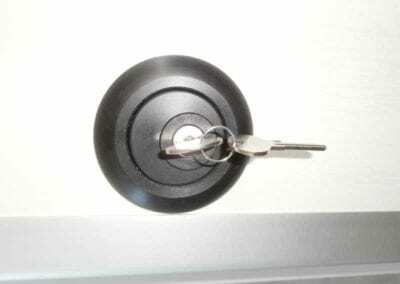 Optionally, we can provide the doors with lock. 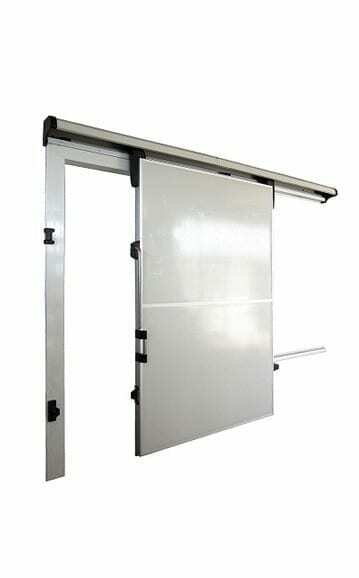 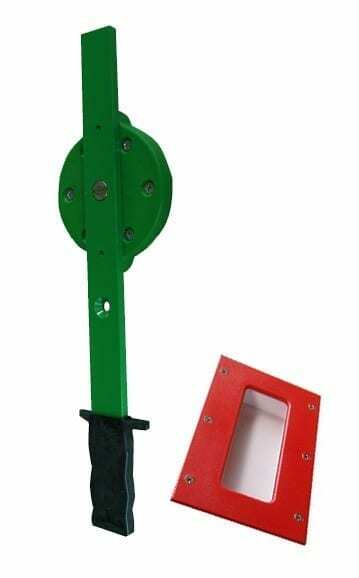 The frame is made from hard shockproof PVC profiles. 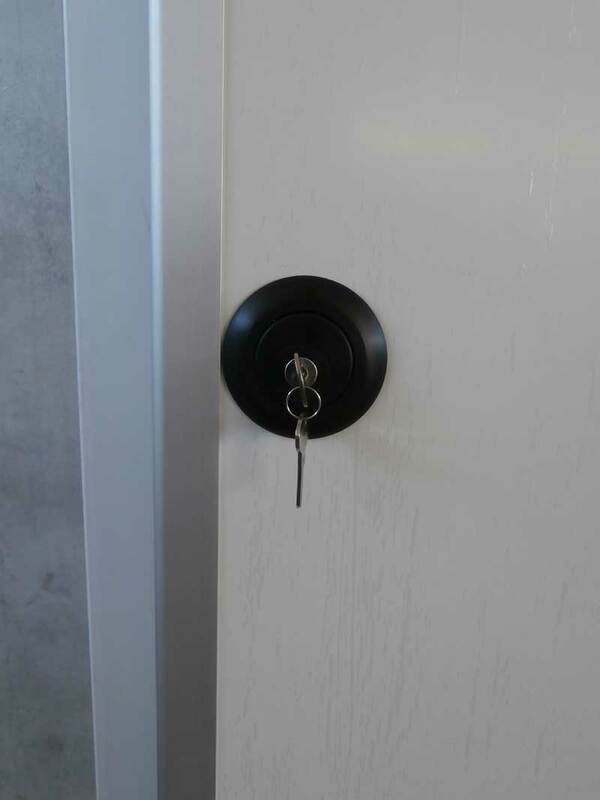 We made it in two types. 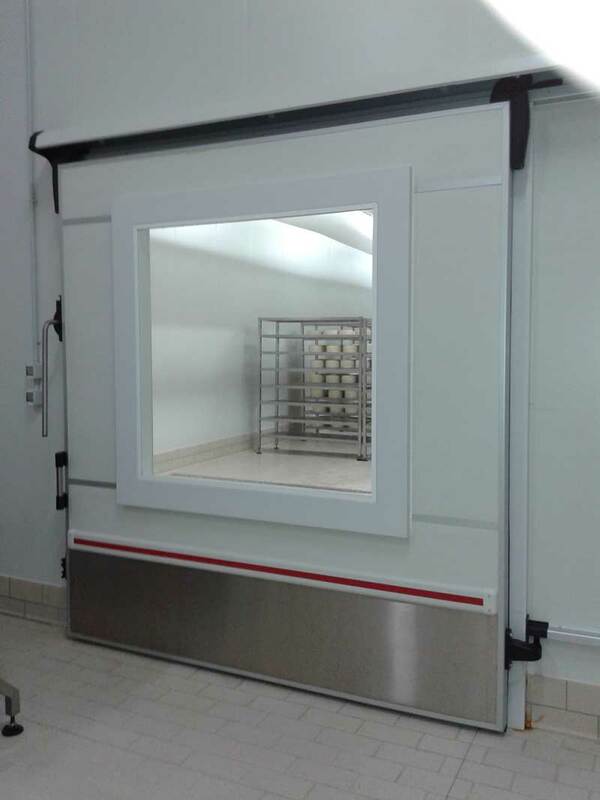 In the first version the frame has the same thickness as that of the cold room and we tighten it on the panel with a counter frame. In the second and more economical version the frame is like an angle 130 x 60mm and we tighten it on the panel with screws. 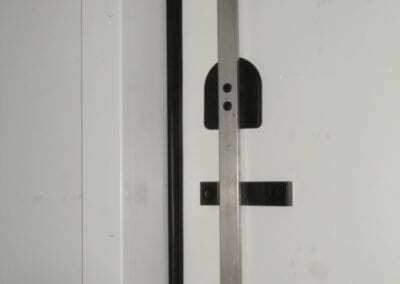 Therefore, afterwards you have to use an appropriate profile in order to cover the rest of the panel. 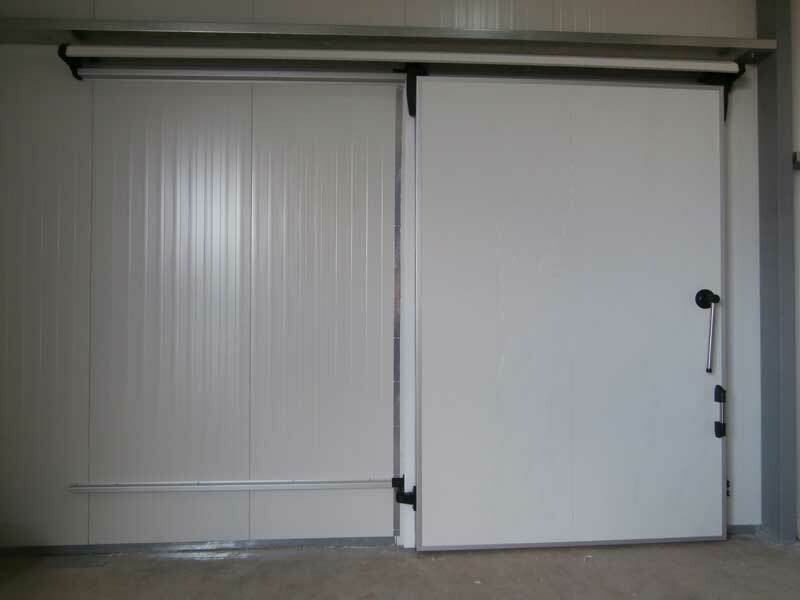 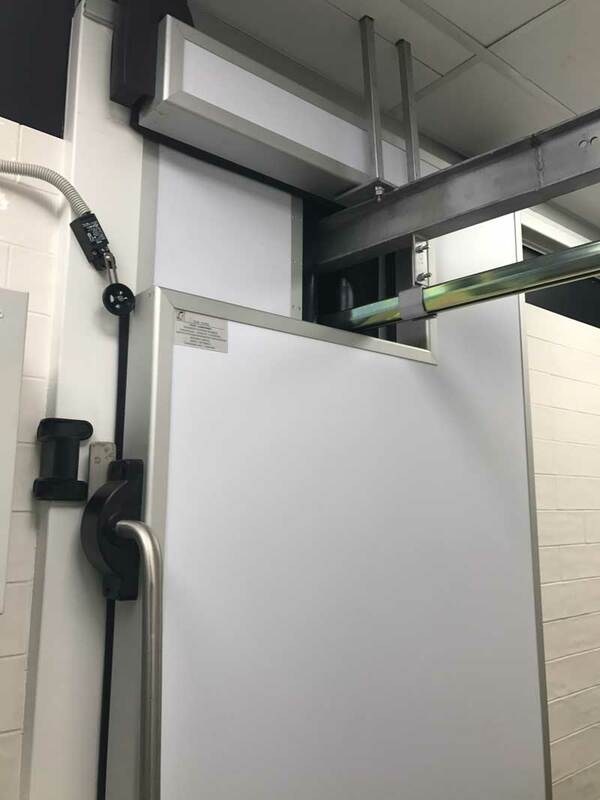 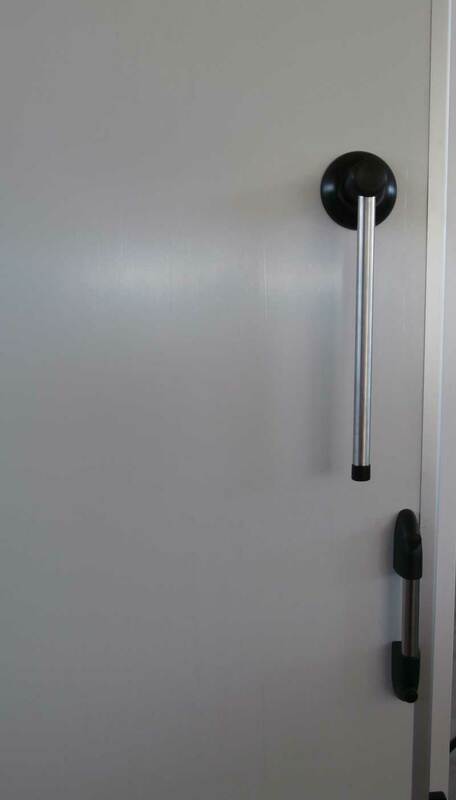 Depending on the use, the lower part of the door can be made in different ways in order to facilitate the entry of people, carts, the installation of ramps, etc.